We all deal with stress every day, and every day our bodies strive to adapt and stay balanced and healthy. In Adaptogens, authors David Winston and Steven Maimes provide a comprehensive look into adaptogens, non-toxic herbs such as ginseng, eleuthero, and licorice, that produce a defensive response to stress in our bodies. Formerly known as rejuvenating herbs or tonics, adaptogens help the body to "adapt" to the many influences it encounters. They increase stamina and counter the normal effects of aging and thus are becoming important tools in sports medicine and in the prevention and treatment of chronic fatigue and other stress-related disorders. Winston and Maimes present the historical uses of these herbal remedies in India, Russia, China, and the Americas and explain how they work and why they are so effective at combating stress-induced illness. Monographs for each adaptogen also present the latest scientific research and include the origin, traditional use, actions, properties, preparation, and dosage for each herb. 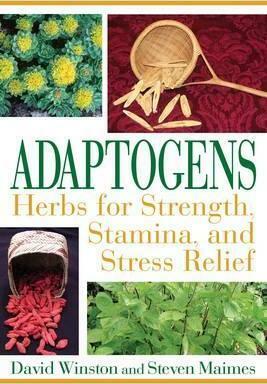 HEALTH / NUTRITION "We need adaptogens for their powerful effect of restoring and protecting our health. Finally, this important healing concept is made accessible to a wider audience." --CHRISTOPHER HOBBS, author of Handmade Herbal Medicines and Natural Therapy for Your Liver "Adaptogens are destined to play an increasingly important role in the future of health care. This book provides an excellent introduction to and comprehensive overview of their traditional uses and of the science supporting their safety and therapeutic benefits." --MARK BLUMENTHAL, founder and executive director of the American Botanical Council "Brilliant! . . . a definitive work on this most important group of medicinal plants." --ROSEMARY GLADSTAR, founder of United Plant Savers and author of Herbal Healing for Women We all deal with stress every day, and every day our bodies strive to adapt and stay balanced and healthy. In Adaptogens, authors David Winston and Steven Maimes provide a comprehensive look into adaptogens, nontoxic herbs such as ginseng, eleuthero, and licorice, that produce a defensive response to stress in our bodies. These rejuvenating herbs and tonics help the body to "adapt" to the many influences it encounters. They increase stamina and counter the normal effects of aging and thus are becoming important tools in sports medicine and in the prevention and treatment of chronic fatigue and other stress-related disorders. Winston and Maimes present the historical uses of these herbal remedies in India, Russia, China, and the Americas and explain how they work and why they are so effective at combating stress-induced illness. Monographs for each adaptogen also present the latest scientific research and include the origin, traditional use, actions, properties, preparation, and dosage for each herb. DAVID WINSTON, RH(AHG), is an herbalist and ethnobotanist who has practiced Cherokee, Chinese, and Western herbal medicine since 1969. He is a founding member of the American Herbalists Guild, an internationally known lecturer on the topic of herbal medicine, and the president of Herbalist and Alchemist, Inc., a company that manufactures over 300 herbal products. He is the author of Herbal Therapeutics and Saw Palmetto for Men & Women and coauthor of Herbal Therapy and Supplements, and he lives in Washington, New Jersey. STEVEN MAIMES, the former owner of an herbal products business in the San Francisco Bay Area, is a researcher, freelance writer, and principal of SALAM Research in Rochester, New Hampshire.